The Solaris Network Administration exam is the last exam netadmins must take to gain the Sun Certified Network Administrator credential -- and with the Solaris 8 upgrade, many netadmins must take the exam to renew their certifications. 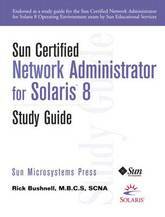 This authoritative guide is the first book to cover the Sun Certified Network Administrator for Solaris 8 exam. Written by the technical lead for the Sun Microsystems team that wrote the Solaris 8 Network Certification exam, it focuses on the most challenging aspects of network and TCP/IP administration -- and offers all the review questions, tips, and resources netadmins need to successfully prepare for the exam. The book presents modular coverage of sixteen networking-related topics in depth, building from basic to more complex topics. Long-time Sun trainer and support professional Ricky Bushnell simplifies difficult topics like DNS, sub-netting, routing, and IPv6 though clear, easy-to-follow examples -- highlighting the key points you need to review to pass the exam. The book contains extensive review questions and self-test exam questions, and is supported with additional questions and updates on the Web.